Tuesday, CatTime.com told you about 21-year-old New York City man Andre Robinson, who allegedly committed a heinous act of animal cruelty when he lured a stray cat close and then kicked the feline roughly 20 feet into the air, according to police reports. When a video of the incident began circulating on the web, social media users worked together to track down the cat kicker, and police took Robinson into custody Monday evening. He has since been charged with misdemeanor overdriving, torturing, and injuring animals, the New York Post reports, offenses that carry a maximum sentence of one year behind bars. Animal advocates hope Robinson’s charges will be upgraded to felonies just in time for his next court appearance June 9. Cat-kicker Andre Robinson is no stranger to committing crimes: He has had eight prior arrests, including one for a 2011 knife-point robbery. Robinson admitted to police that he was indeed the one in the infamous video. The friendly grey-and-white cat Robinson allegedly abused ran off into the bushes after being brutally kicked, obviously injured and shaken. Rescuers and area residents alike spent days searching the area around the Brevoort Houses, a public housing project in Brooklyn, but the poor kitty was nowhere to be found. Veterinarians who’d seen the shocking video said the trauma had at best had likely wounded the feline and at worst may have even killed him. Brevoort residents say the cat frequents their building and is affectionately known as King. Residents and neighbors are disgusted by Robinson’s actions. Another resident who often feeds King, Irvin Berth, watched the rescue attempts with interest. “He’s from the projects, he knows they’re trying to capture him,” Berth joked. After days with no King sightings, people worried that he might have indeed perished after taking Robinson’s kick to the stomach. But luckily, thanks to the work of 16 rescuers from organizations and agencies like the NYPD, the ASPCA, the North Shore Animal League, and the Sean Casey Animal Rescue, among others, King was found alive on Tuesday. “You try to go as slow as possible and gain their trust. Then, once you have sight of them and are available to get them, you have to be as quick as possible so we don’t get injured and so the cat is less stressed,” North Shore Animal League’s Dorit Shani tells ABC News, explaining the rescue team’s methods. 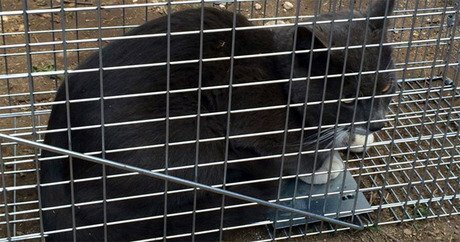 It took the rescuers hours to coax King into a cage, but finally, after a lot of hard work and even more patience, they were able to capture the frightened kitty. King is now resting at the ASPCA Animal Hospital, where his condition is being evaluated. Rescuers hope that King will be able to be placed up for adoption after the police investigation is over. Following his arrest, Robinson was released Tuesday on no bond. His mother, Mary Kirby, spoke with the New York Daily News soon after her son was freed from custody. Robinson’s lawyer insists the video footage is not clear enough to determine the identity of the cat’s abuser, but Brevoort residents — neighbors of Robinson’s — disagree. Two petitions have been started on YouSign.org to see that justice is done.